Buddha Weekly continues its special series “Interviews with the Teachers” with part 2 of an extensive hours-long interview with the most Venerable Zasep Tulku Rinpoche. Rinpoche is spiritual director of many temples, meditation centres and retreat centres in Australia, the United States and Canada and teaches also in Mexico and Mongolia. 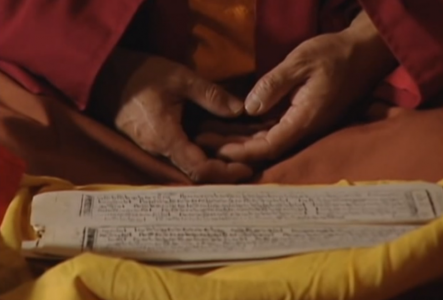 He is also the author of several books, including “Tara in the Palm of Your Hand.”>> Future scheduled teachings from Zasep Rinpoche at end of this feature. PART 2 OF A 3-PART FEATURE INTERVIEW WITH VENERABLE ZASEP TULKU RINPOCHE. Buddha Weekly: How does Buddhism help with today’s problems? Zasep Rinpoche: Today, we all have many different kind of problems. Every person has their own issues, older, middle aged and young people. And society, we have a lot of problems. I see a lot of young people suffering a lot. Some of them don’t see hope for the future. For them, future doesn’t seem bright: the population so big, environmental and social problems. People get depressed and families break up. Especially, young people need activities and positive direction and encouragement. There are so many temptations. It’s easy to associate with the wrong kinds of friends. I think all these easy entertainments, such as video games are not so good. I’m not against technology. Online information and social media are great for spreading the dharma. Problem is, there are no boundaries online. Zasep Tulku Rinpoche teaching at Gaden Tashi Choling Retreat Centre in Nelson BC. Zasep Rinpoche: Anyway, for any student, it’s best to meditate on suffering and causes of suffering. Meditate on the four noble truths. Today, it’s important people study and practice Lamrim. That’s the graduated path. Don’t jump right away into Tantra. Don’t look for magic, quick solutions. If it’s too quick it doesn’t work well. Lamrim means graduated path to enlightenment. Lamrim is a profound Buddhist teaching, profound Tibetan Buddhist teaching. Lamrim helps explain where you are right now, and how to progress and improve step by step. But, there are different Lamrim books. Some books are very traditional, some are less traditional. Some are quite dry and hard to read or understand for newer students. Some topics can be more difficult for newer students, for example karma, obscurations, reincarnation. Some of the traditional texts are very rigid. 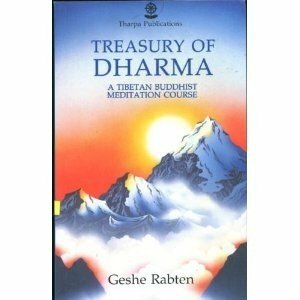 So, I recommend Treasury of Dharma: Tibetan Buddhist Meditation Course by Geshe Rabten. I recommend it because it’s not so long and it’s portable. Some books have too many details to encourage new students. Buddha Weekly: Western Students sometimes struggle with traditional Buddhist teachings on things such as reincarnation. 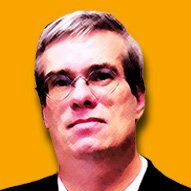 How do you approach this for westerners? Zasep Rinpoche: Of course I believe in karma and reincarnation. If you create unwholesome karma you do create causes for lower rebirth. But for westerners it can be a bit hard. It sounds like you don’t have a choice but to believe in these things. Traditional Tibetan Tangkha illustrating the cycle of samsara and rebirth. Don’t worry about the past. It’s only memories. The future is a dream. Don’t worry about the future. Stay in the now. The most important thing is to watch your body, speech and mind, and if you cultivate virtues, and practice loving kindness, then you are a good Buddhist. On the other hand, if you don’t create virtues and you create negative karma, even if you believe in reincarnation, it doesn’t do you any good. It might even be worse, because if I’ve created bad karma, I might believe I’m going to hell. Then, you are already in hell, worrying about it in this lifetime. Buddha Weekly: What About Hell Realms? That’s maybe even harder to accept for a Western Student. Zasep Rinpoche: For the beginner, when they read the description of hell realms in some sutras and certain Lamrim texts, it seems like these hells are actual physical locations: the hell realms and the other realms. I’m not saying that these descriptions are wrong. I’m not saying these descriptions are inaccurate. But I’m saying you can experience all six realms right here in this life. You can have a hell realm right now in your mind. For example, if your mind is tormented all the time. Today, there is so much suffering and mental illness. If you are suffering now, then you are in already in the hell realm. If your mind is so agitated, angry, distracted and jealous — then, you already experiencing the demigod realm. If you are always greedy, never satisfied, or you feel you are deprived or poor, and you want more, more, more — if you are always grasping after money, then your mind is like the mind of a hungry ghost. If you always blissful, happy, calm, joyful — then your mind is like the god realm. All six realms can be experienced right here in this lifetime. You don’t even have to think about ‘I might go to hell’. You don’t have to wait until the next life, you can experience it now, and see how impermanent these realms are. In this life we have wars, starvation, torture, beheading, awful, awful things—worse than any hell realm could be. Buddha Weekly: How would you advise a student who has very little time? If you have to prioritize, is it more important to learn and study, or to practice? Zasep Rinpoche: Both are important! Even though study is good, if you don’t meditate you don’t progress. More study of Dharma is always good, because you learn, you develop wisdom and understanding. It doesn’t matter how old you are — sometimes, when you are older it’s important to read more books. 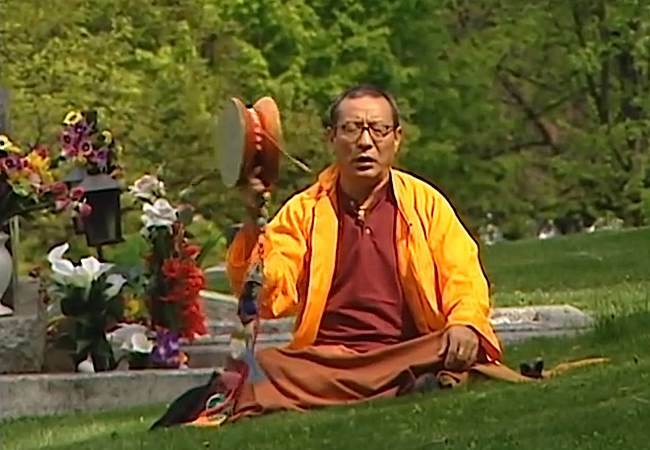 Venerable Zasep Tulku Rinpoche practicing Chod in a cemetery for the benefit of all beings. One very famous Lama, named Sakya Pandita, wrote “Even if you are going to die tomorrow, you should start the Dharma today.” Why? Because your mind continues. Your mind doesn’t die. The body dies, the mind continues. So whatever you study in this lifetime remains with you in your mind as an imprint. Don’t think, “I’m an old man now, waiting to die, there’s no point.” No, you should study. Studying is very important. Also, meditation is very important. You should practice. 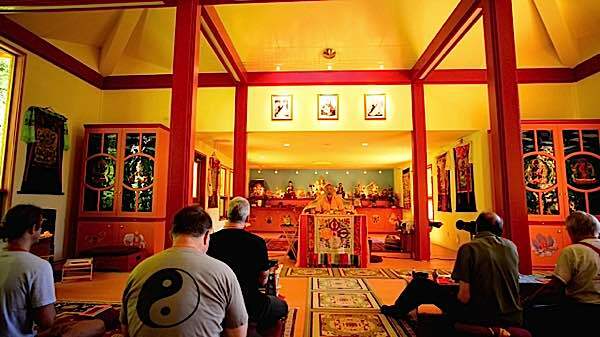 Studying sutras and practicing meditation are both equally important says Venerable Zasep Tulku Rinpoche. Buddha Weekly: You Yourself Are Very Busy. You seem to be always travelling to teachings. Zasep Rinpoche: You really choose to be busy. I say to myself, “I’m a busy Lama. I’m not a lazy Lama, I’m a busy Lama.” Then, I say to myself, “Why am I such a busy Lama?” It’s because I choose to be busy. I have a choice. You have a choice. I like to be busy. For me, it’s good for my mind. It keeps my mind stimulated. Good for my body. 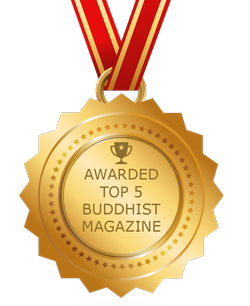 Buddha Weekly: I’ve heard you mention how Psychiatry has adopted Buddhist techniques such as mindfulness? I think you also mentioned Rob Preece’s book, The Psychology of Buddhist Tantra. I remember, you wrote an introduction in one of his books? Zasep Rinpoche: Yes, that’s right. Lama Chopa, the Guru Puja. When you talk about Tantric symbols and mudras and deities and colors and visualizations, the concepts make sense psychologically. Thinking of it this way is good for those already practicing Tantra. People who have received initiations and already understand the deity yoga. But, for beginners, I don’t think it’s as good an idea. People might get confused. Then, people misunderstand. Or they jump too fast into Tantric practices. It helps with one area. People often misunderstand Tantra. They think it’s about magic, or that you get results very fast. For someone already practicing Tantra, yes it can be good. Personal Yidam Deity is often chosen based on what is good for them. For them it’s good to explain how it all works. For example, you have sand mandala, or a tangkha painting, mudras, offerings, tormas and cakes, ringing bell and dorje, chanting, dancing, using musical instruments — all these things are therapeutic. It’s very good for the mind, and for developing concentration. The music and dancing uplifts your mind and makes you very positive. Happy. So, it’s good for people who already have Tantric practice. Buddha Weekly: You sometimes teach Buddhist Debate? Zasep Rinpoche: Traditionally, Tibetan Buddhist debate is only taught in the monasteries. But in the west, students do debate, yes. Debate and logic is very good for your practice. It sharpens the mind, and helps you learn Buddhist philosophy. The Tibetan way of debating is a very ancient way of debating. It originally comes from India, and goes back to Vedic times. So, when you debate like this, there are rules and protocols. It’s not like politicians debating before an election. (laughs) Basically, it’s very good for you to practice debate. Buddha Weekly: Sometimes, it’s difficult to explain Guru Yoga to new students. Devotion to teacher, if you’re not an advanced student, may confuse. What’s the best way to explain Guru Yoga? 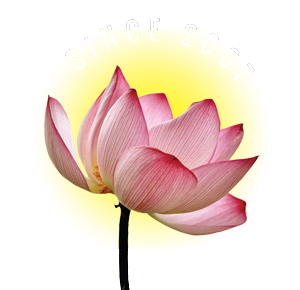 I studied Vipassana meditation in Thailand. In Theravadan tradition, they use the term Kalyana Mitra, which means “spiritual friend” or “spiritual coach.” You go to the teacher and you say, “I’d like you to be my teacher. I want to be your student.” And you start a “spiritual friendship.” Of course, you follow the advice, and meditate, and the student has to be open, honest, and respectful. The teacher also has to be open, honest and respectful of the student. The teacher helps the student decide what to practice, what not to practice. But it’s hard for the teacher. Especially when you’re dealing with many students, it’s hard for the teacher. It’s hard to know the mind of your student. 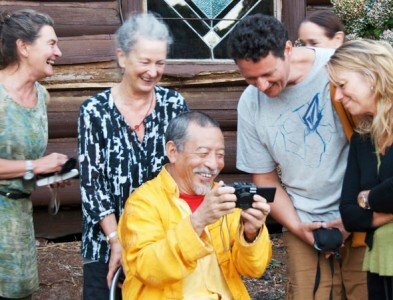 Outside of formal teachings, Rinpoche enjoys a laugh with students at a retreat. From my own past experience, I’ve had students who’ve had issues and past traumas. And teachers have their own issues too. Nobody’s perfect. As long as you’re a human being, you’ll have issues. Buddha Weekly: What about Guru Yoga from a Tantric point of view? So, this has to be interpreted in different ways. When they say, “You should see your Guru as a Buddha,” you should think, what my Guru says is what Buddha says. It doesn’t mean your Guru is Buddha, and he doesn’t even walk on the floor like human beings. He can levitate or whatever. That’s not the meaning. If you think like that, then you are wrong. Guru Yoga is not an easy one. This is why I wrote a “Guideline for Students.”  There should not be misunderstandings. Photo Credit: Collage made from original photos by SkyCave, Shivankur Sharma. For students interested in Tantra, which can include visualizing Buddhas and Enlightened Deities, Rinpoche advised: “You have to think about, first, why do I want so many initiations. You have to think about the commitments. Usually, when you take initiation there are commitments. Buddha Weekly: Is it beneficial or a hindrance to take many initiations in Tantric Buddhism? Zasep Rinpoche: If you took initiation previously, and the Lama returns with the same initiation, it’s beneficial to take it again and again. That’s no problem. You have to think about, first, why do I want so many initiations. You have to think about the commitments. Usually, when you take initiation there are commitments. You have to decide if you can actually follow those commitments. If you take initiation, and you can’t, then you’re breaking your commitment, it’s not very good. Sometimes there’s no commitment, other than the Refuge Vow and Bodhisattva Vow, and the maybe the Lama says, “Well, you do the mantra as much as possible” then it’s simple. Zasep Tulku Rinpoche speaking with a student at the end of a mini retreat on Mahamudra in Owen Sound, Canada. Or, often, the Lama will say “You can take this initiation as a blessing.” Some initiations you can do that. For example, Green Tara initiation or Medicine Buddha Initiation you can take as a blessing without commitment, which means you take initiation only for the blessing, make a connection, but at this point maybe you’re not serious enough — or you don’t have time — to do the practice. Then, later on, when you are more serious, or have more time, you can take initiation as a commitment. You can make your own commitment. So, it’s better not to take too many initiations, that’s the bottom line. Buddha Weekly: What if a student does break the practice commitment? Zasep Rinpoche: If you break your commitment, the next day you should do double. Say, if you have a twenty-one mantra commitment, you do forty-two. But—keep going. Keep doing the practice. Don’t drop it. And don’t think your practice is no longer valid. If you miss your meal, you wouldn’t stop eating, you would just eat your next meal. Vajrasattva is a manifestation of Buddha Conquerer Vajradhara and his practice is one of the most powerful healing and purification techniques in Vajrayana Buddhism. Yamantaka is the Anutara or Highest Yoga Tantra aspect of the Buddha of Wisdom, Manjushri. This practice is at the heart of the Gelugpa Tradition and a source of the highest spiritual attainments. H.E. Zasep Rinpoche will give detailed commentary and instruction and lead discussion on the many aspects of Yamantaka practice. 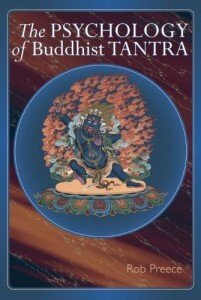 A “must-have” for those who have received the Yamantaka Empowerment. Open to Initiates of Yamantaka practice. Chittamani or “Mind-Jewel” Tara is the Anutara or Highest Yoga Tantra aspect of Green Tara, the Buddha of Compassion and Wisdom. Chittamani Tara is a relatively new practice, coming from a cycle of 13 Initiations from the “Clear Vision” of famed Gelugpa Yogi and Mahasiddha Takpuwa Dorje Chang in the 19thC and is unique to the Gelugpa Tradition. A peaceful, direct but very profound practice of Green Tara, Chittamani Tara is a source of the highest spiritual attainments in Tantra. This Initiation is extremely rare, again from the “Clear Vision” of famed Gelugpa Yogi and Mahasiddha Takpuwa Dorje Chang in the 19thC, like Chittamani Tara and is both unique to the Gelugpa Tradition and unique in that it combines the Deity practice of Amitayeus, the Buddha of Infinite Life with the Guru Yoga practice of Guru Rinpoche. In terms of Gelug practice, this makes it very singular & special. It is a healing and long-practice as well. Buddhism for Busy People, David Michie, ISBN-10: 1559392983 ISBN-13: 978-1559392983, Snow Lion 2009. 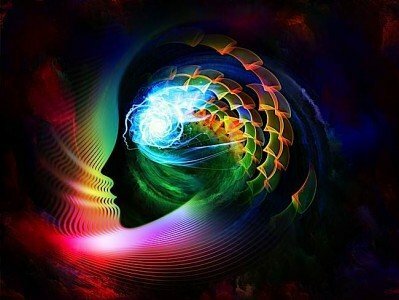 Deity Yoga: Science or Superstition? Vajrayana Deity Meditation Proves Invaluable in Preventing Cognitive Disorders. In What Other Ways is Vajrayana Buddhist Deity Practice More Science than Religion?